BALTIMORE – Step into the large, brightly lit, welcoming Langston Hughes Elementary School lunchroom on a crisp May afternoon and you see a beehive of activity-children drawing colorful posters with the help of teachers, parents and community activists for a 6 p.m. 2-mile walk through the Park Heights neighborhood of West Baltimore. The march has a purpose: Langston Hughes Elementary school is closing in June, the children and teachers having already been given transfer notices to other schools, like the one, Pimlico Elem/Middle, to which the children are marching today, May 20, 2015. Gathering the students, parents and supporters together in the Langston Hughes parking lot, Intea Deshields, a young doctoral student from the Teachers’ Democracy Project, speaks briefly to the group and then courageously leads them through the community to Pimlico Elementary. The children, some as young as five years old, and their parents and supporters leave the quiet neighborhood where Langston Hughes is located, and in a few blocks turn right, onto busy Belvedere Avenue. Very quickly they come across broken side walks; boarded up businesses; caved in houses; and a barking dog tied to a B G & E fence. This is the mile long route many of them will be asked to walk in September. There are numerous ironies in the decision of the School Board to close Langston Hughes in a region of West Baltimore which is but a few miles from where Freddie Gray was killed by Baltimore City police just a month ago. In an area riddled by drugs and crime, Langston Hughes elementary is not only an oasis for the 178 children who attend, but also serves as a venue for numerous after school and community activities which take place in the “relatively new” facility. Built in 1975, the school has air conditioning, a spacious gym, bright rooms, a great principal and creative teaching staff. Pimlico Elementary/Middle School, built in 1910 has no air conditioning, portable units, large classes we are told and is .99 miles away from Langston Hughes. The precise distance of .99 miles is important, Jamal Jones, young co-director of the Baltimore Algebra Project, explains because of a School Board regulation which states that public transportation does not have to be provided to children who live within one mile of the school they are attending. The right to free public transportation is something that Jones highlights as he speaks of a National Student Bill of Rights which the Algebra Project promotes for all students in the country. Among the other rights are: the right to a free public education, the right to physical activity and recreation, the right to high quality food, the right to free health care, the right to freedom from unwarranted search, seizure or arrest. George Mitchell, President of the Langston Hughes Community Action Association, explains the steps that the community has already taken to keep the school open. Under the school system’s “21st Century Buildings Plan,” a 10 year plan launched in 2012, the school was originally scheduled to close in 2017 because of projected under-enrollment. But the enrollment was climbing in recent years until the notice went out to disappointed parents in the fall of 2014 that they had to look elsewhere to send their children. 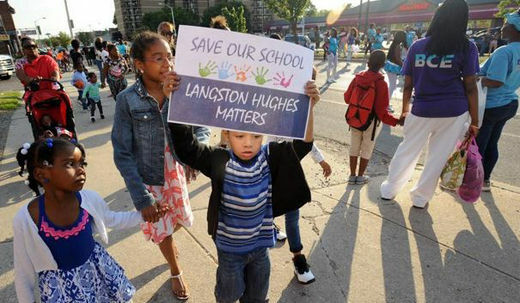 Mitchell and others started appearing before the Baltimore City School Board last December to advocate for Langston Hughes and the role it plays in this Park Heights community. Although all the elements are now in place for it to be closed, the Maryland State Department of Education nonetheless granted Mitchell’s association a hearing before an administrative judge, set for this coming July 20. There is precedence for a public school to be saved in this way. 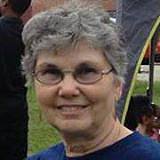 State Senator Lisa Gladden, also an attorney, once argued a case at this level to save a school and was successful. Gladden, along with State Delegate Jill Carter will be the attorneys for Langston Hughes Elementary in July. While the school could not be ready to open by September, parents are hoping that it could re-open in January as was the case for Edgewood Elementary which Gladden represented. One might legitimately wonder why a school board would want to close a school which serves as a hub for community activity, is attractive and well-managed, whose test scores are above others in the area, and whose enrollment was growing before the school board put a brake on it. George Mitchell thinks he knows why: There are 52 charter schools in Maryland, 38 of them in Baltimore. A number of charter schools have been eyeing the Park Heights community, including the Langston Hughes building, for some time. Meanwhile Intea Deshields leads the tired marchers back to the Langston Hughes school parking lot from their two mile trek. In the shadow of the Earles Mitchell street sign, named for George Mitchell’s community activist mother, the children and adults are treated to hot dogs and hamburgers, grilled by Dayvon and Adam of the newly formed coalition, Baltimore United for Change. “This is what it’s all about,” Jamal Jones says, “Community,” …and a new, very young generation learning how to struggle. 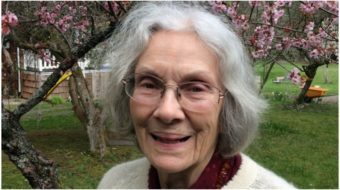 Margaret Baldridge is a long-time activist for social justice writing from Baltimore.